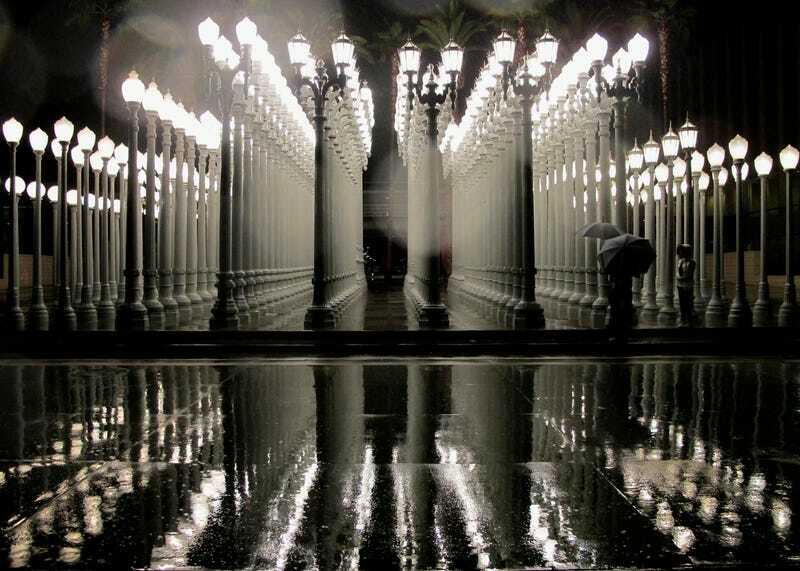 Even if you didn’t know Chris Burden’s name, you’ve likely seen photos of what has become his most famous work: 202 vintage streetlamps arranged with a military-like precision in front of the Los Angeles County Museum of Art. Like many of Burden’s pieces, Urban Light is infrastructurally inspired and technologically impressive. It has also managed to become a symbol of LA: a place to stage engagement photo shoots, a playground, a neighborhood meeting point—in short, a new kind of public square. Residents and tourists alike wander the labyrinth of elegant ironwork, some of it swiped from local streets, gawking at the fringe of towering palms echoing the same symmetrical formation. In his quest to create a winning piece of accessible art for a famously private city, Burden, who died yesterday at age 69, produced a cinematic landscape to properly show off this new Los Angeles to the world. Who was Burden? He actually began his career as a performance artist. In 1971 he burst onto the national stage with Shoot, where he persuaded a friend to shoot him at point-blank range with a .22 rifle. The bullet grazed his left arm and he survived. The entire event could very likely have lived on as the kind of art world urban legend that fills cocktail party chatter, like much of the performance art of the day, but Burden was prescient enough to capture the piece on Super 8 film. In this way, Burden’s performance art would end up pioneering the nascent genre of video art as well. It could also be argued that Burden was the first artist to use the medium of television, when he purchased advertising time on a local station and treated viewers to short clips of his work. Mainstream television audiences were confronted with imagery like a bare-chested Burden squirming across a field of broken glass. His cringe-inducing antics were visually jarring—but it was also impossible to look away. These tiny vignettes made him famous in a way that a gallery show could not. Burden was the first Vine star. Or maybe—since the medium of TV was fleeting back then—it was more like Snapchat. 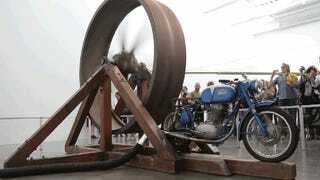 With the construction of a 1979 piece that used a motorcycle to set a giant iron wheel in motion, Burden suddenly managed to make his work larger than his physical being, bridging performance art and sculpture. This would become a signature move for Burden’s new body of work: Building machines that were technologically complex, yet relied on the interaction of humans. One of his most complicated pieces is Metropolis II, a miniature city stacked with skyscrapers and six-lane freeways where 1,100 looping matchbox cars are meant to evoke LA’s autonomous vehicle future (again, Burden was always looking ahead). The entire sculpture took four years to build and is so structurally intense that it can only be run twice per day, and even then a pit crew must monitor the sculpture carefully to disengage potential pile-ups on the tracks. Most of Burden’s contemporary fans were best acquainted with his urban-scale sculptures that played with these ideas of infrastructure and engineering: a replica of the Art Deco tower 30 Rock made from Erector set pieces, a steamroller which appeared to defy physics and hover in midair, a remote control boat hoisted outside the New Museum for his 2013 show Extreme Measures. In fact, Burden’s newest work, which will open next week at LACMA, is a working dirigible named after Alberto Santos-Dumont, who flew one of the earliest versions of the airships around the Eiffel Tower in 1901. While Burden’s later works were purely categorized as sculpture, the audacity of these pieces could also qualify as structural stunts. And by leaving the construction materials visible, every last one allowed the audience to become entranced by the building process, engaging our deepest childhood fantasies of wandering a world made from life-sized Lego and K’NEX. Urban Light was installed in 2008, a few years before Instagram took hold, but the sculpture was selfie-ready before the phenomenon existed. It was almost as if Burden, with his firm grasp on the power of the broadcasted image, the could see the coming rise of social media and merely provided us the proper public spectacle to broadcast this emerging LA. If you go to see the sculpture at any time of day or night—202 beacons warming a formerly dark, dismal stretch of Wilshire—you’re sure to see characters of every background arranging and capturing themselves before Burden’s backdrop. Search #urbanlight on any social media and thousands of images burst forth like flickering candles, the faces in them perfectly lit with a soft glow. In this way, Burden’s most famous work is actually still very much a piece of performance art—except now everyone has a camera, and we’re the stars.